This spectacular cross-section pop-up model reveals the Dome, both inside and out. Find out about the story of the Dome's amazing construction. Discover just how many double decker buses fit inside the Dome and many more mindboggling facts. In association with UNICEF. A sequel to the bestselling Children Like Me - over 1 million copies sold worldwide - this exciting new book focuses on British children who introduce us to their lives and their dreams for the new millennium. Boxed kit with Scale Model of the Dome, Facsimile Documents, 6 Mini-Models of Great Millennium Buildings, Who's Who Poster, Information Booklet, Personal Record Book, Time Capsule Kit, Autograph Book, Fold-out History Timeline, Wall Chart of World Maps, 4 Timelines of Air, Land, Sea and Costume. 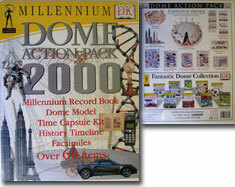 Find out all about the Millennium Experience inside the Dome with this information-packed folder. 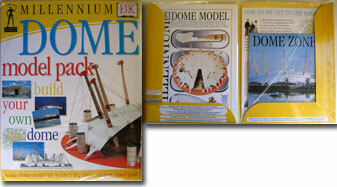 2-pocket folder with paper Dome Model kit, Dome Zones guide, and travel guide. Contains over 80 stickers! 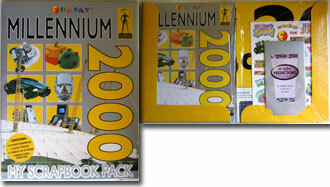 Learn about the millennium with this informative and fun sticker book. Chose the stickers to create your own book of the millennium. Easy-peel stickers can be used more than once. A personal record of the year. Celebrate the year 2000 and capture forever your new millennium memories inside the pages of this special journal. Complete a personal profile listing your hopes, ambition, and favourite things. Men and women who have shaped the last 1000 years. Concise biographies of major figures include scientists, artists, explorers, leaders, and social reformers. A reference section provides a complete list of British kings and queens, prime ministers, Nobel Prize winners, and much more. An accessible and invaluable reference guide for the whole family. Small ring binder with multiple tabbed sections "Diary", "Me 2000", "Memorabilia", "Timelines" and "Stickers". Step into a new millennium and mark the moment with this essential pack! Cram the 32-page scrapbook full of all your special millennium mementos, from tickets and photos to cuttings and autographs. This way, in years to come, you'll have a time capsule to remind you of 2000! 2-pocket folder with 32 page scrapbook, sticker sheets, predictions envelope, "Icons of the 20th Century" poster.